I still say as I have said many times before I think the most likely peak in PMs will be in 2015. Is there no way it could last out that far? Drawing together the last 3 secular commodities / solar peaks the range for commodities peaking is April-Sept 2013 (assuming Feb/Mar solar peak), and for inflation to peak is Jan-July 2013. To add to the inflation prediction, we saw peaks in inflation 5 years apart in the earlier secular commodities bulls, i.e. a smaller peak 5 years before the final peak – and in this cycle we had the first peak in 2008, giving us a potential 2013 final peak. 2000-? If it were 2015 that would be 15 years and so more anomalous to the others than 2013. Clearly we will see in price action when we are making the push for the top – i.e. a parabolic ascent. As we are getting close to historic extremes indicators such as gold:real estate and gold:stocks ratios, I believe such a major rally would also deliver the real extremes in those, i.e it to be the secular ending rally. So 6 months from now we wil be in a better position to judge, not only our two scenarios but also Kent’s that commodities already peaked. I have three planetary cycles that “regulate” the sunspot cycle. With only 24 solar cycles, it is difficult to find perfect matches, with so many possible combinations of the three cycles. But there are always some that are similar. We are currently having a “magenta-type” cycle, which is the most common one, and favors long/weak cycles. We are out of phase with the JuSa-cycle, which supports a long/weak cycle. And we are a bit out of phase with the ~11 year cycle, which means we should have long SCs the next decades (after many decades of short cycles). I have best match with the SC12-14, and here is compared seen from the Jupiter perihelion. Thanks – what’s the timescale along the bottom – is it weeks? The 1906 one is the one above, which would put us in 1905 as you say, except that was a stocks secular bull rather than commodities. 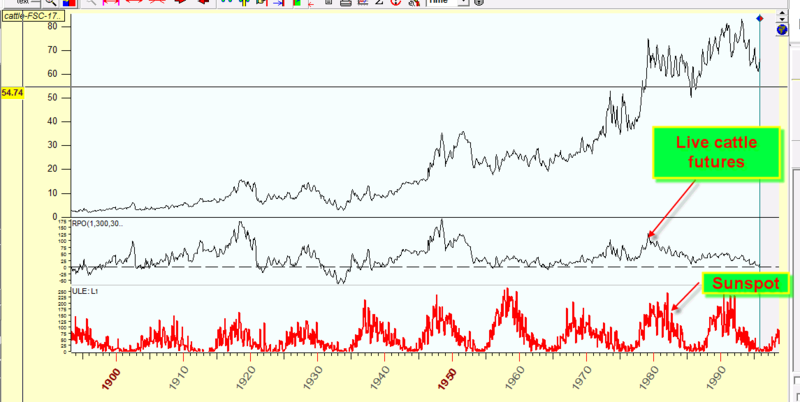 1882-3 was the commodities secular bull ending timezone but that’s too far back to have the key data elements. sorry for all these entries… editing of entry not possible? They have good match with two of the three cycles, and show a similar sunspot-pattern. However the situation in the 11-year cycle was the opposite around 1900. Back then we were also out of phase, but with opposite polarity. 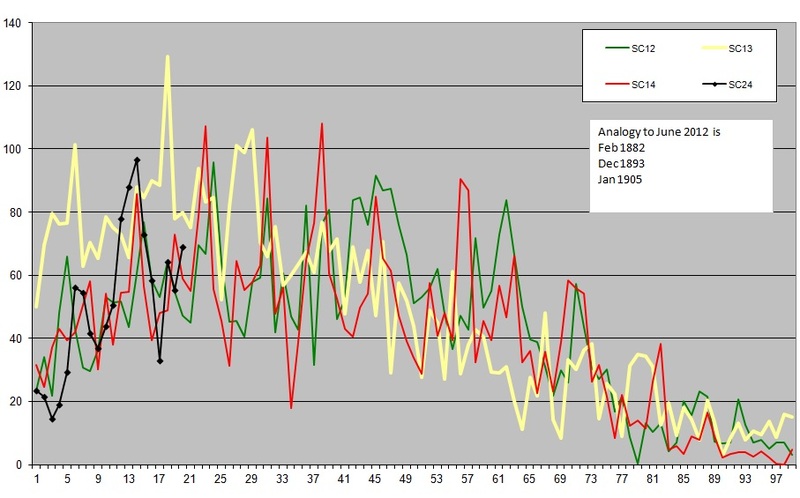 Now the 11-year cycle will try to prolong the SCs, while in ~1900 the cycle tried to jump-start them. The Jupiter cycle says we have similarity with SC12-14, and SC-8 to -2. The 11year cycle is similar to SC5 and SC-10. So one supercycle of 15-16SCs, and another one of 15-19SCs. 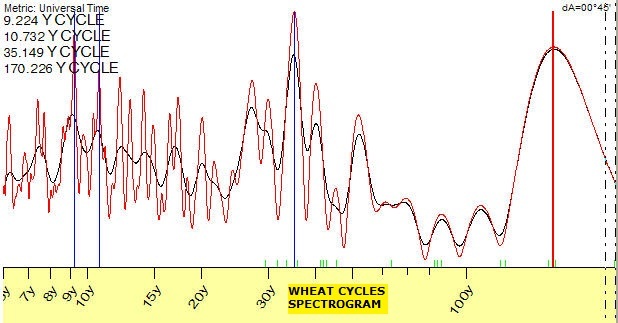 From the limited data, these two supercycles seem not to be in phase or the same cycle. ok. I’m not trying to pin you down in any way but you have said in the past that that beyond 2013 you do not want to own any PMs. Firstly what if anything would change that view? I believe we either saw the PM Peak last year or in 2015. According to dollar cycle analysis we should be seeing relative dollar strength now and we are. This in broad terms lasts until next July. Obviously that is averaged moves so the exact nominal highs and lows will be determined by supply/demand. Do you think the Dow/Gold level of 6 was the low or do you think it is likely to go lower? The other things is you have said the last PM cycle lasted 12 years but the Dow\Gold cycle lasted 14? I don’t want to hold PMs after they’ve made their parabolic rise to reach extremes in indicators close to the solar peak. So there’s 3 things in there that I’m looking for. If we reach next year’s solar peak and gold has not taken out 2011’s high then a 2011 secular peak would look more likely. If gold does exceed 2011’s highs in the next 9 months then I expect it to make it’s parabolic rise, i.e. if it can move up into clear air then I would expect the blow off top to occur. MS’s forecast is for investor and central bank PM demand to recede as of 2014, with supply expected to increase too. So a belated peak in 2014 potentially. But I’d still be looking for gold to break up and out of its range within the next 9 months. If it can’t do that from the recent and current oversold/overbearish extremes then the picture will look bearish indeed for PMs. As I’ve said, the global wierding is currently pushing up food prices and if the difficult weather continues for the next couple of months then the food price spike prediction is likely to come good. The Dow-gold ratio should go lower than 6, but that’s again based on timings (the ratio should bottom ahead with its lowest reading, if gold has yet to peak). I’m open minded about somewhere between 1-6, but there are other indicators – secular overbought/overbullish, parabolic rise, gold:stocks and gold:realestate etc. I expect between these indicators and indentifiers we should be able to judge when gold, and the dow-gold ratio is making its finale. I should add that the NECSI chart shows where and when riots and protests occurred around the world – showing the link with food price spikes. I strongly disagree with John’s period count in secular bull markets for commodities. 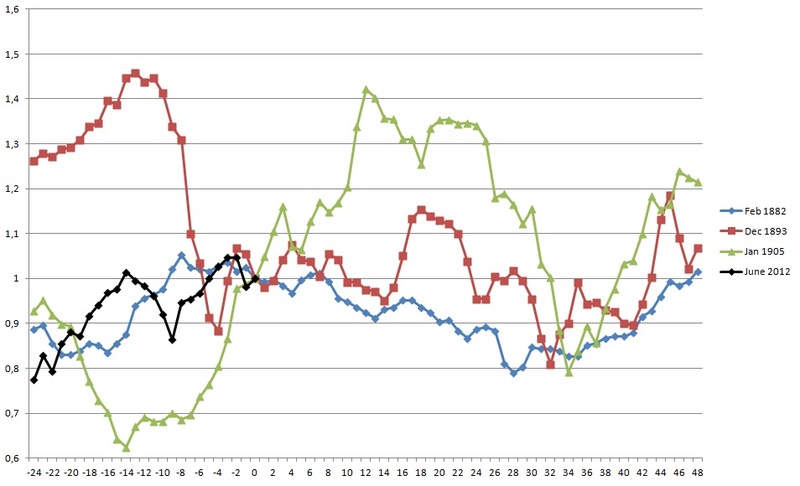 Proper research of historical data shows different dates. Average age of a commodity bull market is about 17 years and the longest was 23 years. Three out of the last 5 secular bulls have lasted more than 2 decades. The shortest was the bull market in the 70s, but the vertical price rise made up for the time. Here is the historical chart – click here. My view has always been around 2015/16, but I have always stated that it is very possible that we see the bull market move towards the end of the decade towards 2018 or even in 2020! The problem is that the current bull market has been stopped at its tracks in 2008 with a crisis which has differed investment in supplies. I work in a coal and iron ore industry of Australia. I can tell you that supplies are massively lagging demand and BHP / Rio Tinto have been cutting labour and supplies yet again in 2012 due to price slump. It takes a long time to open up a mine, ssometimes over 10 years, o there is a decent possibility that this bull market will last two decades! All bull markets end in a phase of mania and vertical price rises, as we can see from the chart above. So regardless of the time frame and my opinions, smart investors should sell the spike and that is all one needs to know! 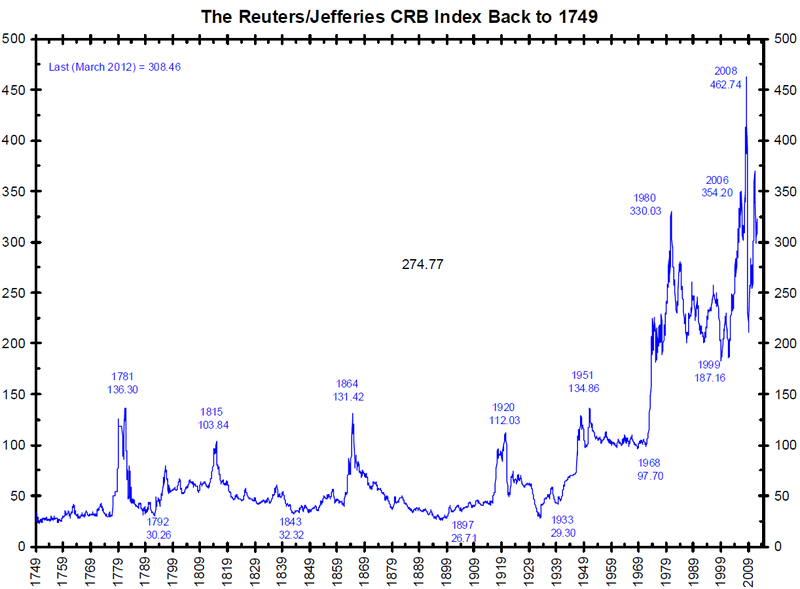 The R/J CRB index is one quarter oil. The CCI index, which is more equally weighted amongst commodities, made an index high in Oct/Nov 1947. The 1951 peak was the echo bounce and just oil made a new high, like when the SP500 made a slight new nominal high in 2007 – it was still in a secular bear since 2000. In the previous cycle, metals peaked in 1916, agri in 1917 and again it was just oil that made an echo bounce to a new high in 1920. The bottoms to which you refer are the oil heavy nominal bottoms. Commodities tracked sideways in the 1920s and 1930s, only taking off as of 1938. 1933-1938 was still sideways secular commodities bear. 1897-1906 was still sideways secular bear. And if you look at the earlier cycles you can again see your ‘official’ bottoms precede a lot of sideways action (before actually taking off), which is secular bear, not bull. Secular bears go sideways, secular bulls go up. But what’s most important is the understanding of what drives the secular commodity cycles, which is two main things: (1) supply lag – it takes 10 years roughly for a new mine or energy field to come on stream, hence after 10 years have elapsed the supply comes steadily on stream to fuel a new secular bear and (2) solar cycles. 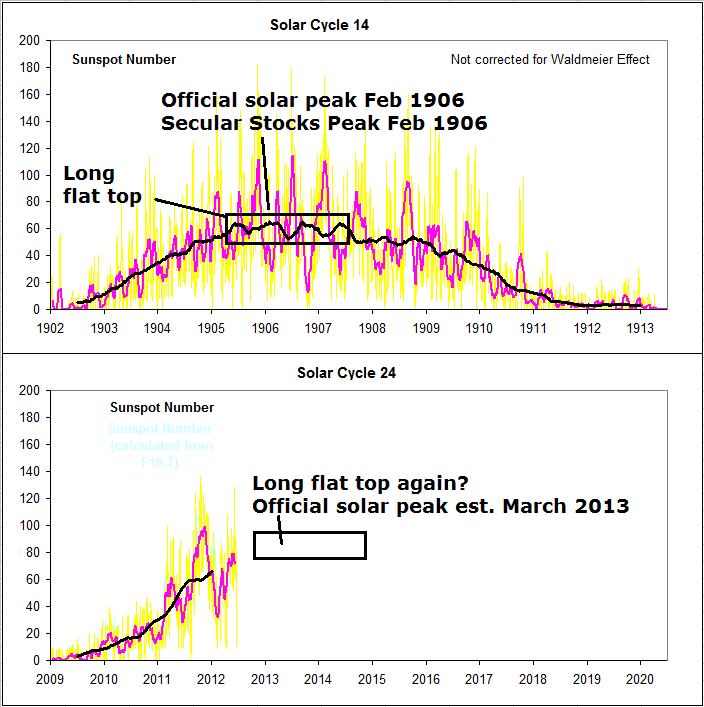 I have a great deal of evidence on my site for how and why solar cycles influence secular asset peaks and bottoms, so won’t go into it again here, but as one solar cycle is roughly 11 years, you have the two combining (supply & solar) to produce secular commodities cycles that last around 10-12 years.